A response to our 'Minds run free' cover feature. As avid runners and practitioners working in sport and exercise psychology, we were immediately drawn to the ‘Minds run free’ article by Christian Jarrett and Ella Rhodes in The Psychologist (May, 2017). The article provided readers with an interesting insight into the psychology of why people start to and continue to run. In particular, sections on ‘How do runners keep going’ and ‘The dark side of running’ stimulated much deliberation, closely aligning with research we are conducting at Staffordshire University. As Jarrett and Rhodes emphasise, even though the psychological benefits of exercise are established, there lies a darker paradox that requires closer inspection. Here, the benefits of running (e.g. enhanced mood and self-esteem) may in some cases have psychological and physical implications (exercise dependence, eating disorders). To better understand this paradox, we draw upon rational emotive behaviour therapy (REBT), which is based on the Epictetus’ premise that ‘people are disturbed not by things, but by the views they take of them’. In REBT, these ‘views’ are encapsulated by the concepts of rational beliefs and irrational beliefs. Rational beliefs are non-extreme, flexible and logical, and lead to healthy emotional and behavioural responses to adversity. In contrast, irrational beliefs are extreme, rigid and illogical, leading to unhealthy emotional and behavioural responses. When those dependent on running miss an opportunity to do so, their irrational beliefs (e.g. ‘I would like to run therefore I must, I can’t stand missing a run and it is terrible if I did’) result in unhealthy cognitions (‘I hate myself for not running’), emotions (e.g. anxiety, guilt) and behaviours (e.g. undereating). In the high-performance athletes we have worked with, irrational beliefs, despite their maladaptive consequences, ironically can acutely provide the impetus and dogged determination for runners to withstand and tolerate the physical and psychological demands of running (training or competing). Indeed, for a runner during the deepest and most challenging moments of a race, an extreme, evocative and dogmatic belief such as ‘I must not fail, and I’m a loser if I do’ may provide a functional stimulus to continue no matter the cost (pain, injury). However, what are the costs of such beliefs, and do the potential acute performance benefits outweigh the costs? On the Smarter Thinking Project blog, Martin Turner refers to the old story of Damocles and King Dionysius, drawing comparisons between irrational beliefs and the sword of Damocles (see tinyurl.com/m8avnfz). There are also many accounts whereby extreme and dogged irrational beliefs come at the cost of runners’ physical health. Here runners may push their bodies beyond exhaustion during a race or overtrain – commonly associated with burnout (chronic physical and emotional exhaustion). Runners lose sight of personal wellbeing in the pursuit of personal success. We do not wish to cast a dark shadow over what is undoubtedly a healthy and meaningful pursuit for millions; rather, considering the detrimental effects of irrational beliefs on psychological distress, we urge runners to keep a close eye on the relationship they have with running. Ensuring the lacing-up process is driven by a healthy preference rather than a dogmatic demand to run. 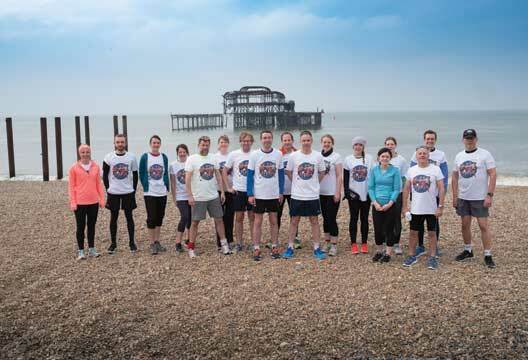 At the Society’s Annual Conference in Brighton in May, our editor Jon Sutton and journalist Ella Rhodes led an early morning jog: search #MindsRunFree on Twitter. Some negative effects were experienced.